This is magic. 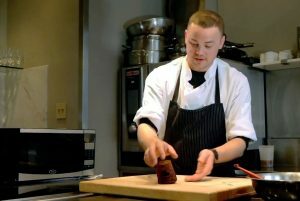 In just a minute you can be eating a light, fluffy, chocolate cake, thanks to the expertise of Boston chef Stephen Oxaal. 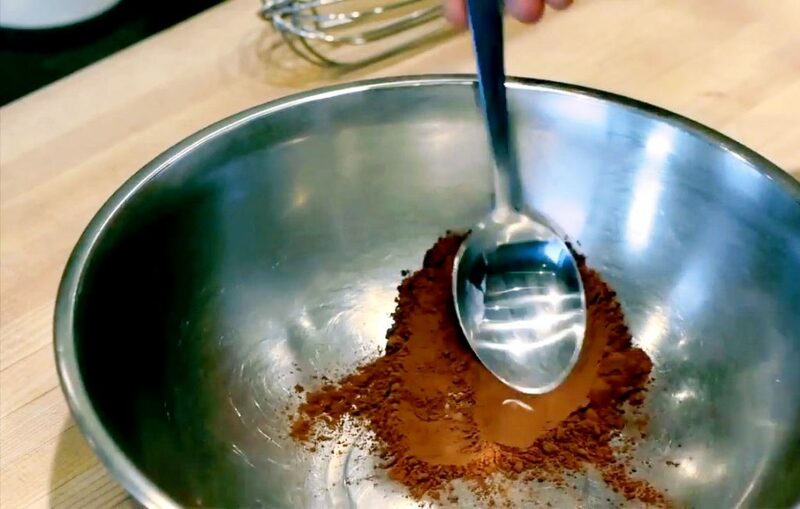 Cocoa powder tends to clump so be sure to smoothen it with the back of a spoon. Oxaal was one of nearly 50 chefs in the Dorm Room Chef series I created for the Boston Globe. The series featured chefs preparing dishes college students could make in their dorm rooms. I’ve made this several times at home and suggest serving it hot with whipped cream. Let the cake rest in the cup for a minute before taking it out. Although it’s best to make this in a paper coffee cup, I’ve used a ceramic coffee cup and found the results about the same. For this recipe you'll need a paper coffee cup. However, a ceramic mug also works. It just makes a little denser cake. Step 1 Mix the wet and dry ingredients (stir them together but not too much). Step 2 Cut three tiny holes in the bottom of the paper coffee cup. Step 3 Pour mixture into the coffee cup. Step 4 Microwave on high for about 1 minute and 15 seconds. Step 5 Test to see if it’s done by inserting a toothpick (or paper clip if that’s all you have). If it comes out clean, it’s done. If not, put it back in the microwave for a few more seconds. Step 6 Let it rest a minute before tipping the cup over and releasing the cake. Serve hot with whipped cream.